Diamond Willow tells the story of twelve-year-old Willow who lives in Old Fork (a fictional town), Alaska. She feels as if she doesn’t belong at school. She wants to be noticed and have friends but is, at the same time, terrified of being with other people. This fear makes it hard for others to get to know her well enough to develop friendships. Like so many of us who feel lonely or invisible, Willow loves dogs. She is able to talk to them and not worry about judgement for how she feels or what she says. She also derives strength from the love she feels so clearly from her grandparents. Her parents, older brother and younger sister are also loving, but everybody who has had a special grandparent knows that a grandparent’s love is deep and abiding–and easy to both give and receive. Life with our immediate families can be complicated; grandparents provide that steady anchor of love while we navigate the journey of growing up. Willow convinces her parents to allow her to mush the dogsled to her grandparents’ house alone for the first time. On her return trip she has an accident that results in serious, potentially tragic and fatal consequences for her and her lead dog, Roxy. The author explains to the reader in a brief introductory note that a Diamond Willow is a tree that grows in northern climates. When it’s wood is polished it reveals reddish-brown diamond (shapes) with a dark center. The diamond shapes form when a branch is injured or breaks off; the dark center is the scar from the missing branch. This remarkable tree is, of course, a metaphor for the entire story, as Willow begins to see her own scars as well as her own unique beauty and talents. Ms. 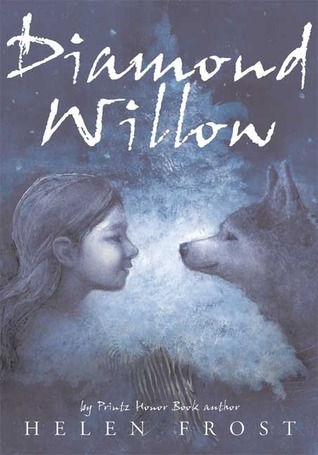 Frost tells Willow’s story mostly in series of diamond-shaped poems. (There are asides sprinkled throughout told by Willow’s ancestors who have returned to life as animals.) The diamond shape on each page further weaves the metaphor of the Diamond Willow throughout the words themselves. I appreciated Willow’s poignant twelve-year-old voice as well as the realistic details of the dog teams and mushing. (Although not an expert, by any means, I know professional mushers and have attended the Bear Grease which is a dogsled race in Northern Minnesota.) Rhythmically, visually, in plot and character this book is extraordinary.